Ani Villas has announced plans to debut its fourth property in the Dominican Republic next summer. Now under construction, the new resort juts into the Caribbean on a four-acre, north coast peninsula, minutes from the country’s best beaches and a Trent Jones clifftop golf course reminiscent of Pebble Beach. Designed by the Estudio Sarah Garcia in the Dominican Republic, the property features 14 bedrooms, ample living spaces, a spa, sports facilities and a large event pavilion. “It’s one of those locations that really makes you wonder whether you’ve seen any place as beautiful,” said Ani Villas principal Tim Reynolds. “This one’s been a long time in gestation. “We spent three years on environmental impact studies alone. Reynolds, a one-time trader who co-founded Jane Street Capital, founded Ani Villas as a new category in luxury accommodation: the private resort. Each Ani Villa has the facilities and amenities of a five-star hotel, including fully staffed kitchen, bar, spa, pools, leisure coordinators and concierge services – but offered to a single group in residence. 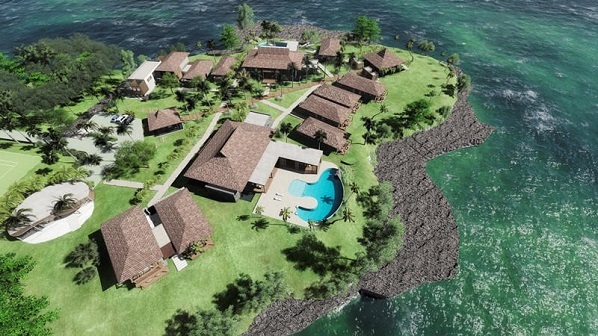 The private resort concept taps a growing trend among groups of people who want to vacation in company, though not with strangers. Ten years ago, the travel industry minted a phrase to describe the movement – togethering - and there’s been nothing but momentum ever since. One New York-based consultancy group earlier this year found that nearly half of the top one per cent of US travelers plan to vacation with friends, 41 per cent with kids and almost a third as part of a multi-generation party. In Sri Lanka, Ani Villas opened over the 2015 holidays as a pair of two mutually exclusive estates, one with seven bedrooms, the other with eight, all designed by renowned architect Reda Amalou. In Thailand, the ten-bedroom private resort opened in January and sleeps 20 on the shores of Phang Nga Bay. Four of those bedrooms feature interior hidden pools, in addition to the resort’s 42-meter beachfront pool. And in Anguilla, where the Ani Villas concept took root in 2011, ten suites command a dramatic cliff top location overlooking one of the island’s most notable “secret” beaches.